11 March 2013, Singapore – Race promoter Singapore GP is inviting volunteers to sign up as a volunteer race official for the 2013 FORMULA 1 SINGAPORE GRAND PRIX. Public registration for marshal recruitment is open from today, 11 March until 31 March 2013 (11:59). "Since the inaugural night race in 2008, we have trained over 2,500 volunteer marshals," said Mr. Gabriel Tan, Clerk of the Course, Singapore GP Pte Ltd. "With a retention rate of at least 85% – one of the highest in Formula One™ – it is as much a pleasure as it is a challenge to continually raise the bar each year. 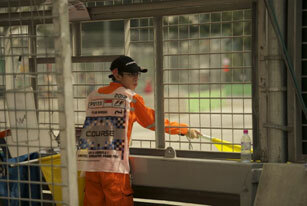 I look forward to working with the new volunteers in making the 2013 FORMULA 1 SINGAPORE GRAND PRIX a roaring success." Now in its sixth year, the night race continues to receive glowing reviews from the Formula One™ fraternity, including Mr. Bernie Ecclestone, who hails Singapore as a "jewel in F1's crown which keeps getting polished." A total of 150 positions are available in key trackside functions, including observers, track marshals, flag marshals and fire marshals. Depending on the area of responsibility, each marshal can expect to clock a minimum of 32 hours of training. First-time race officials will attend approximately seven days of theory and practical training, conducted over weekends starting in May 2013. Highlights of the hands-on training include performing recovery and extrication exercises on a Formula BMW open-wheeler and a Subaru WRX. Similar to previous years, senior officials will continue to receive specialist hands-on training in fire safety and track recovery, as well as attachment opportunities overseas. This year, 36 senior officials have been selected to travel to Australia for the 2013 Clipsal 500 Adelaide and the 2013 FORMULA 1 ROLEX AUSTRALIAN GRAND PRIX as well as Malaysia for the 2013 FORMULA 1 PETRONAS MALAYSIAN Grand Prix to gain practical trackside experience. Members of the public interested to apply for the volunteer marshal positions will need to be 18 and above as of 1 January 2013, physically fit, fluent in written and spoken English, commit to all scheduled training sessions and available to participate in all three days of the race (20 to 22 September). Successful candidates will be notified by 30 April 2013. Applications must be submitted via Singapore GP’s official recruitment website https://raceofficials.singaporegp.sg. The efforts of the Singapore volunteer marshals in previous years have not gone unnoticed, with two of them receiving international recognition for their contributions to motorsports. Volunteer race official Miss Nurulaini Ariffin has been selected for the inaugural Women in Motor Sport Officials Exchange Programme, a collaboration between the Singapore Motor Sports Association (SMSA) and the Confederation of Australian Motor Sport Limited, the National Sporting Authority for motor sport in Australia. Officiating for the FORMULA 1 SINGAPORE GRAND PRIX since 2009, Miss Ariffin is the second female to be appointed to the role of Sector Chief in the history of the night race. As part of the programme, SMSA will sponsor Miss Ariffin to represent Singapore in various Women in Motor Sports activities and participate in the 2013 FORMULA 1 ROLEX AUSTRALIAN GRAND PRIX in Melbourne as a race official. Another regular race official has also been recognised for his efforts with the Grand Prix, this time by the FIA Volunteers and Awards Commission at the 2012 FIA Officials Awards. Singaporean Mr Michael Gray received top honours as FIA Best Secretary Of The Meeting of the Season. Joaquín Verdegay de la Vega, President of FIA Volunteers and Officials Commission, said it was "not easy to have to choose between so many energetic, motivated and efficient personalities who have played a major role in motor sport or helped to improve it." "His involvement in Motor Sport, his leadership and sense of initiative scored an immediate hit with the members of the Awards Committee of the Volunteers and Officials Commission." Mr. Gray, who has been volunteering with the FORMULA 1 SINGAPORE GRAND PRIX since 2008, said, "It is a great honour to receive the FIA Best Secretary of the Meeting of the Season award. To start from scratch five years ago was an enormous challenge, and I owe many people thanks in helping me to learn the ropes and carry out my job. The award is a reflection of the hard work put in by the 1,200 volunteers who help run the race and are the unsung heroes of the Grand Prix. I am very fortunate to have the opportunity to work with such a fantastic team of committed volunteers."